Chipotle comes from the word chilpoctli, meaning 'smoked chilli', and is the primary chilli used in Mexican-inspired cuisine. 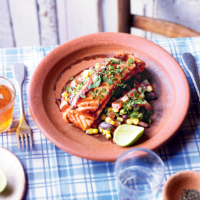 It gives a wonderfully rich, earthy taste to the salmon but can also be added to salsa, stews and combined with other spices to make marinades. a little of the coriander. Bake for 15 minutes until salmon is just cooked through. 3. Meanwhile, mix together the kidney beans, sweetcorn, pepper and remaining coriander. Mix the zest and juice of half the lime into the yogurt and toss into the bean salsa. 4. Top the salsa with the salmon and serve with the remaining half lime, cut into wedges. Try this with meat - spread the chipotle paste onto chicken breasts or joints before roasting or stir-frying. Mix into ketchup or mayonnaise as a dip too.